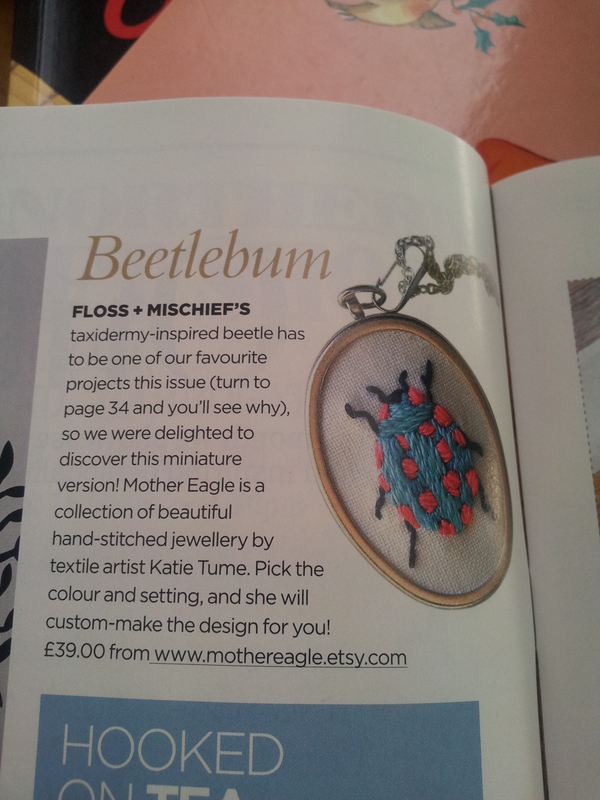 The Mother Eagle made-to-order Travelling Beetle miniature embroidered pendant has been featured in this (September 2012) month’s issue of Cross Stitcher magazine. Fame at last. I won’t mention that at first glance to the less attentive reader it may look like it is attributed to the other bug-designer in this issue, Floss and Mischief. I won’t mention that. And other breaking news – I am going to be featured on the amazing Feeling Stitchy blog on Saturday! It’s an interview with me. I guess now that I am a ‘Textile Artist’ – officially in print and all that. Anyway, check it out on Saturday if you care. Don’t forget – The Mother Eagle shop is having a sale all August – don’t miss out!